Oyster Jewelry Series was inspired by the shape of oyster shells found in Bull’s Bay, just north of Charleston. An oyster develops characteristics unique to the waters in which they grow, a metaphor for how place can shape an artist’s work. The design has elegant, clean lines that are based on the exterior contour of the oyster shell and reference the continuous connection to the saltwater marshes surrounding Charleston. Kaminer’s original design approach interprets the form to the essential shape. 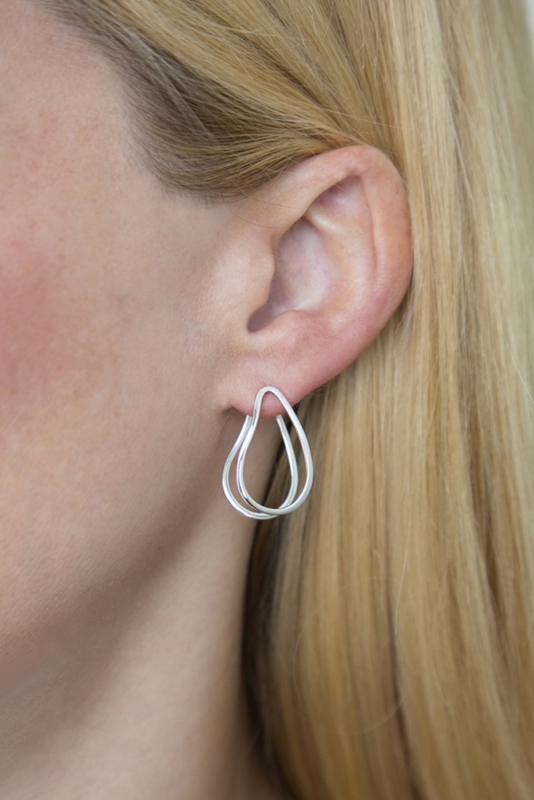 Clean, fluid lines are distinctive to Kaminer’s design style and contour line drawing influenced this jewelry series. The oyster shapes were fabricated and formed by hand with silver wire and finished to a smooth, high shine finish. It is a labor intensive and time consuming process, but the unique end result is stunning. This double Oyster Earring design has a two-part system for the post and clutch. The clutch has an internal spring mechanism that sits into the post grooves, creating a secure grip. To release the clutch, gently squeeze the side tabs in and the clutch will easily slide off of the post.